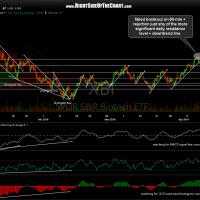 In addition to the biotech video + static charts last week, I had also shared establishing my first swing short position in the biotech sector (via an LABU short) in months, along with a day trade that I took last week. While the day trade didn’t pan out, the biotechs peaked the very next day & so far that swing trade is playing out nicely. FWIW, I still think the sector offers an objective swing short entry with a stop above Thursday’s highs & might soon add XBI and/or LABU as official swing short trade ideas although I’d like to see the 54.40ish area, which is support, get taken out first as a minor reaction at this point is likely. Of course, official or not, each trader must decided what positions to trade & when to take them. Only time will tell if my longer-term bearish outlook plays out or not but I can say that the short entry with not just the biotech sector, but also all those leading biotechs stocks that I posted last week that were just shy of very solid resistance levels was about as objective as it gets. A bit disappointed that I didn’t at least add an official trade for a quick pullback but to be honest, my hesitation was due to the fact the broad market has been going nowhere lately; up one day, down the next although in the bigger picture, the QQQ still remains below that very critical & key resistance level (New Year’s gap) and still looks ready to roll over any day now. Any particular reason for using XBI and not IBB Randy? jegersmart- Yes, Because I have positioned short in LABU for what might morph into a multi-month swing trade. 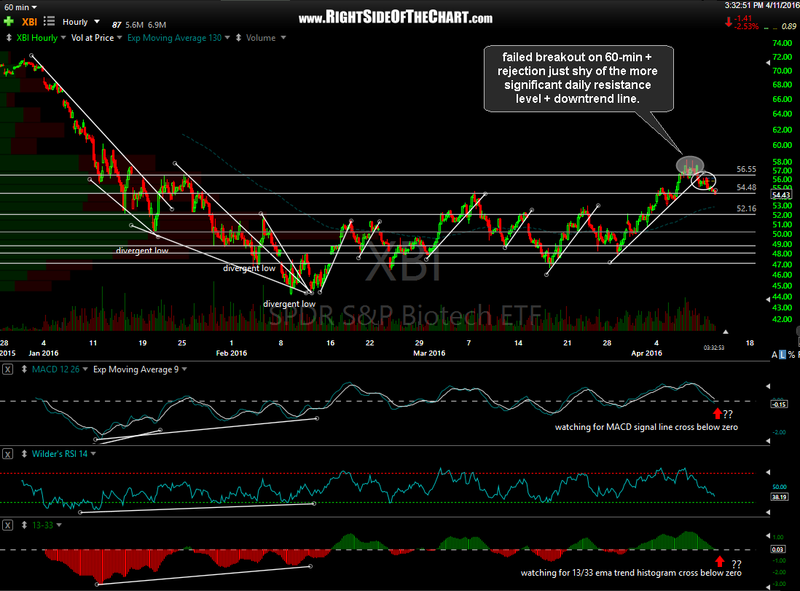 If so, using the charts of XBI is best for timing my entries & exits was well as any key technical developments as it tracks the same index as the 3x leveraged LABU & LABD, the SPDR S&P Biotechnology Index. Any way we can zoom in on these charts? Would be really helpful! yaya- Are you viewing the charts on mobile or desktop? When any of the charts are clicked on while viewing on a desktop, they will expand to the original size (which is quite large & captured in high-resolution), unless your monitor is too small, in which case it will be resized. I’m looking into restoring the previous image viewing software which had the pan & zoom options for desktop. Mobile devices will still allow for pan & zoom but you have to click on the image to expand it first before you can pinch to zoom in & out as well as pan the image. Also, Barron’s saying biotech is “back” and should go higher after double bottom recently – what’s your opinion of this article, @rsotc? 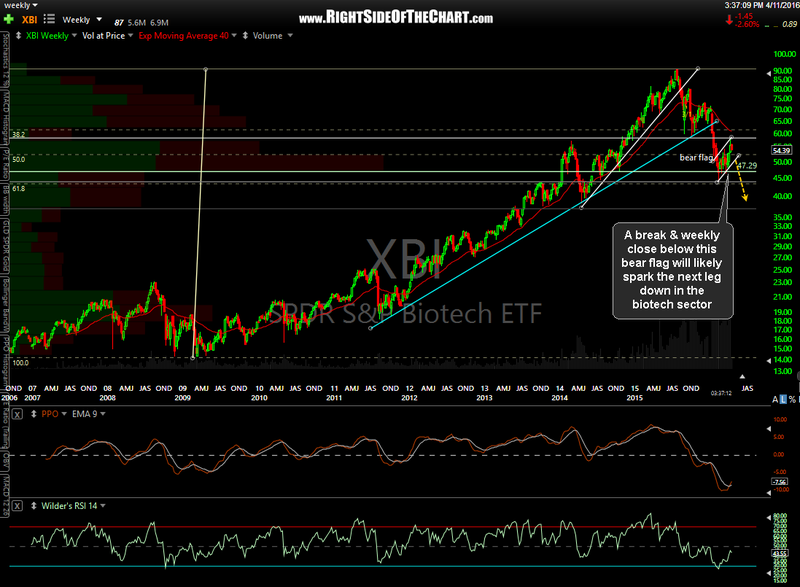 @yaya This is a late reply to your question regarding the link you pasted to a Barron’s article on biotechs. It was held as suspected spam by the system since it contained multiple links (the @rsotc tag is a link to my profile). I just noticed that in the spam folder & approved the comment. I wasn’t able to access the article as a Barron’s login was required. 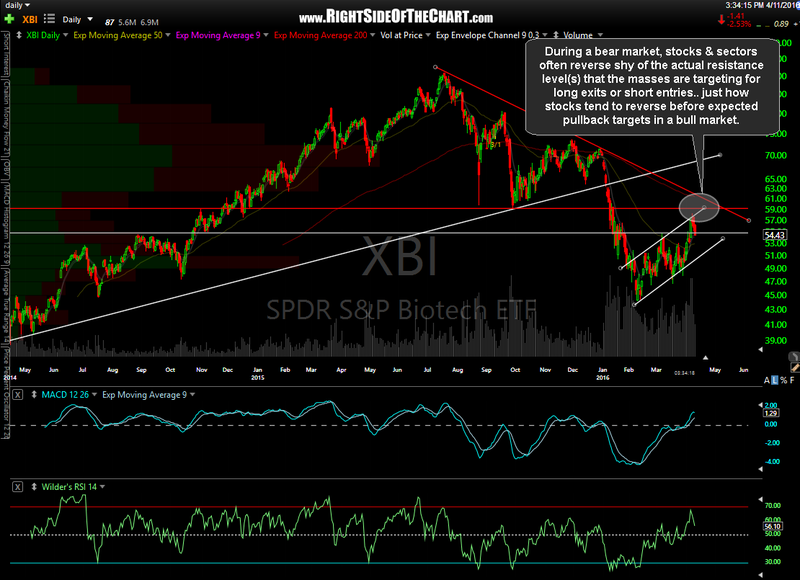 I will say since the date that article was published (April 11th) the biotechs (XBI) dropped 12% into the lows on Friday. Only time will tell if they are correct but it still appears to me that the next 20-30%+ move in the biotech is more likely to be to the downside than the upside.